CALA is an international, educational organization with a mandate to provide high quality training, certification and access to current information for its members and others in the active living community. With a holistic approach to leadership, equal importance is placed on the mind, the body and the spirit. CALA training courses, workshops and conferences are designed to develop the excellence to be found in everyone. Participation in CALA events provides opportunity for the "the mind to discover, the body to move, and the spirit to soar". The professional development needs of CALA members are enhanced by a diverse offering of workshops, specialized courses and annual conventions. CALA's mandate is to advance the level of expertise and create a unified body of aquafitness leaders and aquatic rehabilitation specialists. As a consequence, participant satisfaction and the professionalism of the industry are enhanced. CALA does not aim to supersede training programs offered by other organizations. The goal is to work in a mutually beneficial and supportive atmosphere to promote continuing growth and development of aquafitness leaders and aquatic rehabilitation specialists in Canada and international locations. CALA is linked with provincial, national and international fitness and health organizations. CALA training and certification exceeds the basic standards and is recognized as the gold standard in aquafitness leadership and aquatic rehabilitation in Canada. 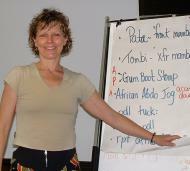 The Canadian Aquafitness Leaders Alliance Inc. (CALA) was established by Charlene Kopansky in 1993. The company grew in response to the demand from fitness professionals for focused leadership and training in the specialized field of aquafitness and aquatic rehabilitation. The Canadian Aquafitness Leaders Alliance Inc. (CALA), is dedicated to providing a high quality training, certification and communication network for aquafitness leaders and aquatic rehabilitation specialists. CALA promotes professionalism and excellence through thoughtful integration of the mind, body and spirit.